Outdoor decks can provide years of service as the go-to spot for entertaining, barbecuing, or just relaxing on a sunny day. But wood decks are not expected to last forever. Lashed by rain and wind and further weakened by sun exposure, wood decks can collapse due to rot and other structural imperfections, injuring close to 34,000 people annually. Repairing your wood deck and its weak posts, discolored deck boards, splintered boards, and loose fasteners is one way to keep your deck in top shape and everyone safe. But when wood rot is involved, it's often best to remove the rotten wood entirely and rebuild part or all of the deck. Since potentially dangerous fungus often accompanies wood rot, you should wear a NIOSH 95 respirator, not just a dust mask, when demolishing rotten wood deck materials. Not all weakened wood in a deck is rotten. For example, wood may become splintered or cracked as a result of impact from fallen limbs. In this case, the wood can safely and effectively be repaired because the damage is localized. But wet or dry rot can affect larger expanses than is obvious from the surface. Often, a deck's wood posts or beams may look relatively intact from the outside but the inside can be rotten and crumbly. With rot, the wood typically feels soft and spongy and the outer surface is discolored. Paint may be bubbly. When you push a screwdriver into the wood, it will push in easily and the wood will crumble. Fungus often accompanies both types of rot. 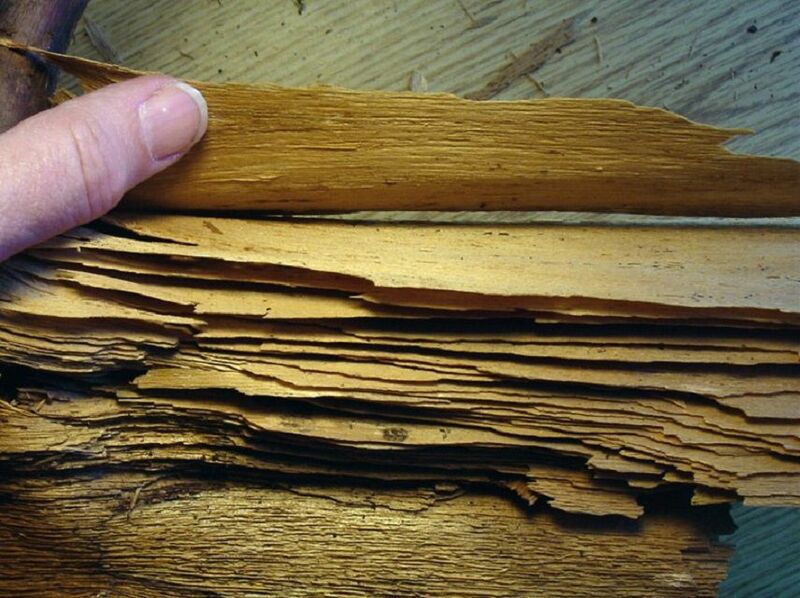 The rotten interior will be highly porous and will fall apart by touch, often crumbling with a texture similar to dry bread or delaminating in strips or flakes. While standing on the ground or on a ladder next to the deck, use a claw hammer or pry bar to remove rotten wood deck boards. Be sure to use safety glasses. Pry off as many of the intact sections as possible. After intact sections are removed, turn the boards over and pound out the nails from the back. Turn over again to the front side, pull out the nails with the claw, and discard the nails. Partial sections of rotten wood remaining on the joists can be chipped off with the pry bar. Since nails will remain on the joists, pry these off with the claw hammer and discard the nails. Rotten wood deck posts are more difficult to remove than deck boards because they are significantly larger and typically are anchored to the ground in concrete. Cut the deck posts off in several sections to make them easier to handle. Use a reciprocating saw, circular saw, or twin-blade saw to make those horizontal cuts. The blades of any of these saws are usually not long enough to sever the post in one continuous cut. Instead, begin the cut on one side of the post, then shift to the other side of the post and complete the cut. Rotten wood deck railings and guards are especially dangerous because people using the deck depend on them for safety. Since most people using a deck assume that railings and guards are secure, they may lean against them with their full weight. Remove rotten railings and guards by using the hammer to strike from below. Hit upward. This should dislodge the nails holding the rails or guards onto the vertical balusters and posts. Continue by sliding the pry bar under the railing or guard and prying upward. Posts that support railings and guards can subsequently be removed by hand. With gloves on your hands, firmly grab the post and pry it downward. This will dislodge nails holding the post from below. Deck wood is usually too voluminous and heavy to be disposed of in your regular trash. Not only that, many municipal trash authorities have restrictions about disposing of building materials in home trash pickups. Because much of the wood is rotten, it is generally not of much value for reuse. Since deck wood is usually pressure-treated with chemicals, it cannot be recycled. Call a hauling company to have the deck materials taken to the nearest landfill. If you have a truck, you can dispose of the materials by yourself, usually during certain time periods. For safety, remove all nails and fasteners as soon as they come off of the demolished deck.